The first time I heard the name of Jeanne Marguerite Chevalier was over twenty years ago. A book about her life started to take shape in my head roughly eight years later, in 2002. Preliminary research followed. The drive to learn more about Jeanne and write her story, however, only became an obsession one cold February day in 2011 when I stood in St. Nicolas church in Coutances where she was baptized on June 8, 1643. And now, finally, I am happy to announce the publication of this first version of the history of her life, just one day before the 300th anniversary of her death. 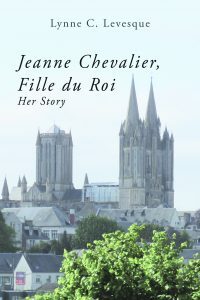 Jeanne Chevalier, Fille du Roi: Her Story is now available at http://www.harvard.com for purchase in the United States and Canada. I have chosen to make it available first through Harvard Book Store because I support independent bookstores and because that bookstore provides amazing encouragement (and services) for authors like me. The book will be offered on amazon.com by early December so that it can be available to international readers. The French edition is scheduled to be published in the spring, 2017. I will send out a notice regarding its publication closer to the date. Jeanne’s is a story full of facts, mysteries, and unknowns. It’s a story of endings and new beginnings. And it’s a story of much courage, stamina, will, and many choices. This first version provides – as much as is possible — the details of those endings, beginnings and choices, all set in the context of the times and places where she lived. My journey to tell Jeanne’s story is not over. As you will see in the book, there remain many gaps to be pursued, particularly in France, and questions to be resolved regarding Jeanne’s life and those of her three husbands. I am determined to continue the research. In the meantime, if readers have any feedback, alternative interpretations, corrections, or additional information to fill in the blanks, please email me at lynnelevesque@gmail.com. The journey to date, while challenging, has had many rewards not captured in this first edition of Jeanne’s history. Along the way in this search to uncover the facts about Jeanne’s life, I have had many extraordinary experiences and marvelous adventures and have met an amazing number of outstanding people. All of those stories and hopefully some more answers or some resolution to my remaining questions are the subject of my next book on Jeanne! For now, anyone interested in reading the story of her life, can find Jeanne Marguerite Chevalier, Fille du Roi: Her Story at http://www.harvard.com. It’s also available for purchase on their shelves at 1256 Massachusetts Avenue, Cambridge MA USA. 1.617.661.1515. I do hope you enjoy Jeanne’s story!